This envelope was posted in Glasgow on 22nd Dec 1954 addressed to Panama Canal Zone. It was placed aboard B.O.A.C. Boeing Stratocruiser G-ALSA in Glasgow and flown to Prestwick where in an attempt to land, the plane crashed and caught fire. Many passengers and crew were killed and although most of the mail was recovered, it was found to be in a badly damaged condition. This cover illustrates the two-line unboxed cachet in violet. It reads: SALVAGED MAIL / PRESTWICK-25-12,54. 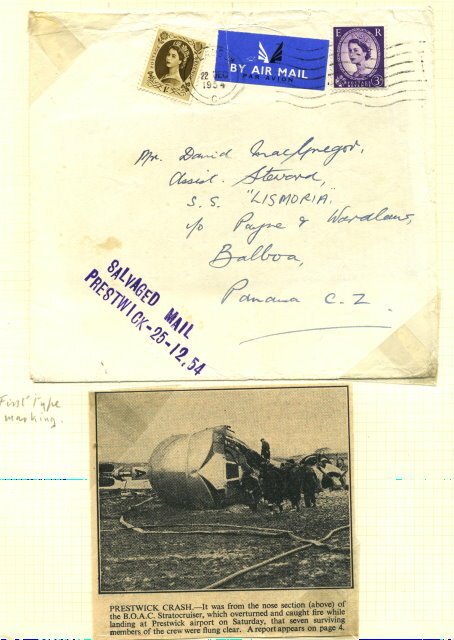 The newspaper clipping shows the extant of the damage to the plane.